Herriman is working hard these days, so we're scanning hard in solidarity. 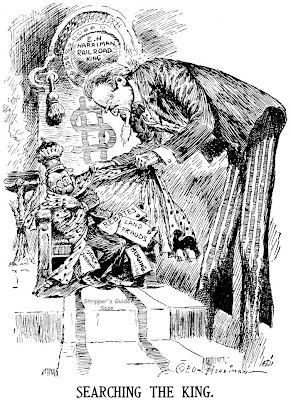 On January 6 Herriman does two cartoons; the first is about the Interstate Commerce Commission finally taking a hard look at Union Pacific railroad magnate E.H. Harriman's wheelings and dealings. Today the news is broken that Harriman did a stock dividend manipulation in concert with Standard Oil. The second cartoon is a huge full page width boxing extravaganza; Jim Jeffries still looking for takers on his $30,000 purse offer is surrounded by all the possible opponents and various managers and hangers-on. 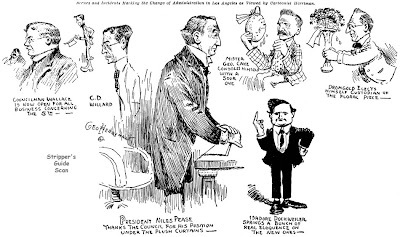 On the 7th Herriman comes across with a cartoon commemorating the last day in office of Los Angeles mayor Owen McAleer. As Herriman indicates, McAleer had done an excellent job of running the city -- his replacement, Arthur Harper, will definitely not be eulogized in so fine a fashion. Note that Herriman must have been unhappy with his original drawing of McAleer's face -- there's a pretty clear square that's been redone. 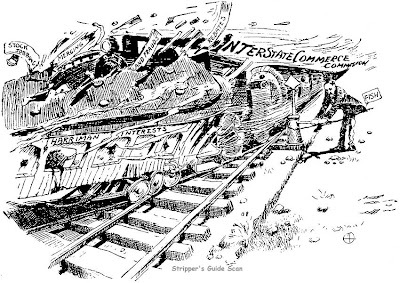 On the 8th Herriman comments once again on the Harriman stock irregularities; Stuyvesant Fish, recently ousted from the presidency of the Illinois Central railroad by Harriman, is rumored to be able to shed some unflattering light on his business dealings. Apparently nothing ever came of it, at least I can find no evidence that he testified. Our last cartoon serves as an introduction to some personalities in the new Harper-led administration in LA. 1898 was a busy year for Richard Outcault. After spending 1897 at the New York Journal he spent the new year jumping back and forth between Hearst and Pulitzer no less than four times. Somehow in the midst of all this paper-hopping Outcault found time to strike out in a completely different direction, having two series printed in the Philadelphia Inquirer. 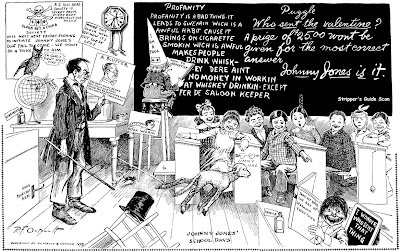 The samples above are from the first series, originally titled The Country School but later renamed for the sometime main character, Johnny Jones. Later in the year another series, titled The Barnyard Club, also ran in the Inquirer. The Country School ran from January 2 to February 20 1898. Although the only paper known to have printed these series is the Inquirer, Outcault may have been trying to syndicate them to other papers -- there's a rumor that a Pittsburgh paper also ran the series. Also interesting is the copyright on the feature, to "Connor & Outcault". Who is this Connor? No one seems to know. I checked my newspaper histories and can't find a likely Connor that might fit the bill. Thanks very much to Cole Johnson who supplied me with a beautiful sharp set of photocopies of this series (twice since the first set got lost in the mail!). Hello Allan. Nice blog! I´m very intersted in the first days of sequential storytelling. And of course R.F Outcault! Sometimes i have also a look to auction galleries. Resntly id found a rare treasure, that sold for $25.300.00 by Heritage. It shows a beatiful hand-colored comic strip from Outcault,with the Kid and Buster Brown together in one strip. Do you know this? Id wrote a small article about it. By clicking the picture on my blog you go to this page. In the description is a hint of collectively four strips with this crossover. Do you know something about the other three onepager? And (with a look on the clock :) another question. Do you know something about a recommendable biography about Outcault? In germany its very hart to find something about this theme. Perhaps you can give me a tip. As for a bio of Outcault, I think the closest thing we have is Bill Blackbeard's "R.F. Outcault's The Yellow Kid". Thank you for help and the tip! I will search for it! 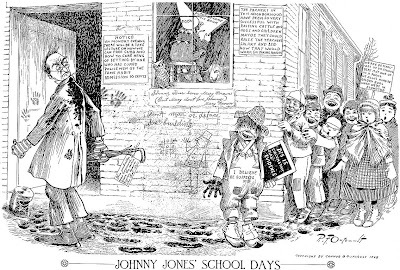 The first newspapermen were cartoonists, period. 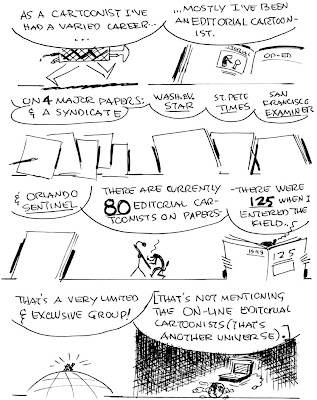 Some members of the craft might be inclined to argue the truth of that flat statement by Reg Manning, McNaught Syndi­cate editorial cartoonist whose work is distributed to more than 125 newspapers, but he's willing to take on all comers to convince the doubting Thomases. In a monumental mural now adorning the walls of the Phoenix Press Club, the Pulitzer prize win­ner for cartooning in 1951 has documented his pet theory that prehistoric man carved news pic­tures on rocks long before he learned to write squibs for the Paleolithic Pioneer Press. There­fore, reasons Mr. Manning, the first newspaperman was not a writer but a cartoonist. 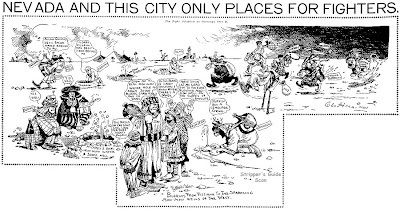 To date only club members and a few visiting firemen, such as the aviation and travel writers who flocked to Phoenix early this year for "quickie vacations" as guests of the local chamber of com­merce, have seen Mr. Manning's masterpiece of newspaper humor depicting the first news stories of mankind tapped out on stone. All visitors to the press club in the Hotel Westward Ho have been wowed by the mural. Be­cause it has a potentially wide appeal to all newspapermen who might be curious to know how their profession started thousands of years ago, Editor & Publisher has obtained permission to repro­duce one section of the mural and the key to the primitive petroglyphs portraying the first news stories of the stone age - and how they were covered by the first cartoonists. All told, 81 news stories and newspaper situations are depicted. Four months were required to complete the mural at Mr. Man­ning's home, in between his weekly stint of six cartoons for the McNaught list and a local one for the Arizona Republic. Reg dreamed up all the situations and gags in the mural and its key. Originally nine feet long, as ex­ecuted in tempera, the mural was enlarged and reproduced in exact color and detail on three walls of the club dining room by Art McFair, a Phoenix artist. It was completed a year ago. Mr. Manning, whose cartoons have appeared in the Republic for a quarter of a century, evolved his theory about the origin of the newspaper business while roaming about Arizona's canyons, study­ing cavemen's pictures he found carved on the walls. He sums up his theory this way: Arizona's first news reporters were cartoonists, whose first edi­tions, tapped out on stone, may be seen in the files of a thousand canyon walls. Depicted at the left of the mural (see cut) is one of the first newsmen. "Arizona's original broadcaster who came ages before the micro­phone is portrayed at the right extremity of the mural (not re­produced here). He is the Town Crier of the Pueblos. In the Hopi villages of northern Arizona, town criers still announce news daily, as they have for centuries past. "The primitive petroglyphs shown present paleolithic picturization of peoples and plights, phil­osophy and phrases, peculiar to press and radio, as our prehistoric predecessor might have pictured them." 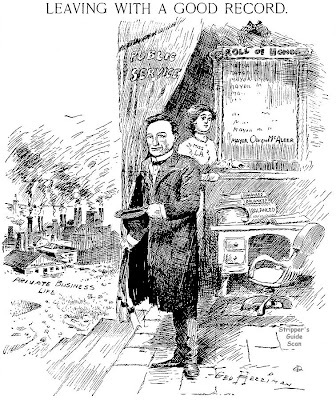 Thus does Mr. Manning, with a thousand canyons to back up his theory, stand pat on his statement that the first newspapermen were cartoonists, as shown in his mural. Other sections not reproduced here depict the original comic strip, the first "love nest" story, members of the world's first press club gathered around the bar and "the first political column (grapevine and a little bull)." His favorite of favorites among the cave char­acters he created is "proofreader catching arrers." It shows the first proofreader on earth catch­ing arrows flying in his direction. If any newsmen are unconvinced about Reg's theory, let them come to Phoenix to see his pictorial evidence of the world's first scoops achieved by the primitive cartoon­ists. If they're still unconvinced, then Reg's ready to eat the biggest cactus Arizona can produce. 2. The only two kinds of birds you meet in this business: (A) The bird who wants to get his name in the paper; (B) The bird who wants to keep it out. 3. Which came first, (A) the thunderchicken, or (B) the egg? 4. The very first news story-Weather; (a) lightning, (b) clouds, (c) rain. 5. A usually reliable source-the horse's mouth. 6. The stone axe-a weapon so horrible it was going to end war. 7. The Original Big Story. 8. A reporter and his by-line. 12. "Don't quote me, but..."
13. X marks the spot. 15. Headline, with three sub-heads. 19. The M.E., who else? 20. Newshawk. This symbolism is really deep stuff . . . note the nose for news, looking at both sides of the question . . . note the target he frequently is ... note equipment for leg work . . . note also he hasn't sprouted wings. 21. The spear-a weapon so horrible it was going to end war. 22. "Here I am on my first real assignment. Imagine ME, a rough, tough, glamorous reporter." 23. "Why wasn't my story in the paper?" 24. Evolution of punctuation: The Question Mark, (A) Woman has always been a puzzle to man, so she was first depicted in the center of a maze, with man, below, amazed. (B) Later and lazier artisans simplified the picture. (C) In this form the mark is used today. 25. Evolution of punctua­tion: The Exclamation Point. 28. The bow 'n' arrow - a weapon so horrible it was going to end war. 29. Dotted line indi­cates where the body fell. or was pushed. I am a history teacher who has recently discovered the true comics series 1941-. We are constanly looking for new ways to teach our children but all we have to do is look to the past. Have you ever heard of companies republishing old magazines? I have been trying like mad to find a contact number to suggest they try republishing their magazines a believe there would be a large audience. Any ideas where a teacher can obtain some of these magazines for a reasonable price? Or any ideas how to get these people to republish? Issues of True Comics are relatively cheap on eBay too. 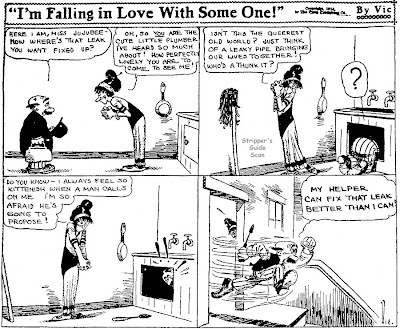 Obscurity of the Day: I'm Falling in Love with Some One! Here's Vic Forsythe, future creator of the long-running Joe Jinks, showing in no uncertain terms that he was no women's libber. I'm Falling in Love with Some One! ran in the New York Evening World from January 7 to February 7 1914 during a extraordinarily prolific period for the artist. Forsythe practically squeezed everyone else out of the Evening World, which had formerly been a revolving door for practically every cartoonist who set foot in New York City. Forsythe was, intentionally or not, instrumental in changing the Evening World's cartoon make-up into the more modern mode of having a standard set of, if not comic strip titles, cartoonists appearing daily. 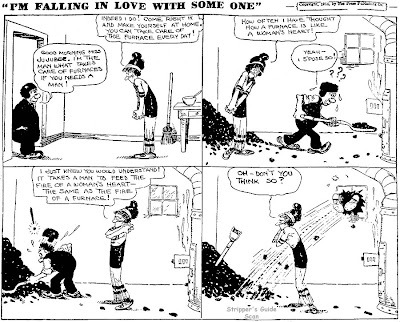 While this particular strip didn't last, Forsythe's Flooey and Axel, and later Joe Jinks were among the longest running strips that appeared in that paper. It seemed pretty ironic to me that Jim Williams died in Huntington Memorial Hospital in Pasadena. I once did a short stretch in Huntington and a rather longer one in Pasadena myself. Both the institution and the city can be described as somewhat posh. They are also somewhat dull. Since Jim Williams wasn't dull and wasn't at all posh, I've wondered what the hell he was doing in that neck of the woods. He should have died out on the lone pray-reee. Every once in a while a real original comes along and when he bows out, something goes that will never be re­placed. Jim Williams was such an orig­inal. He had lived the sort of life that Americans don't live any more—college football ringer, boxer, railroad fireman, pre-World War I cavalry­man, machinist and finally cartoonist. Today they take a job with Batton, Barton, Durstine and Osborne at age seventeen, get married and settle in New Rochelle for life, where with other dullards they practice together­ness. I never ran across the word "to­getherness" in any of Jim Williams' cartoons. I think the word would have made him upchuck. 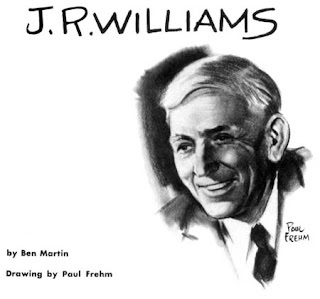 I saw my first Williams cartoon about 1925, when I carried a paper route for the San Francisco Daily News. It featured "Out Our Way", which was then about three years old. I thought they were great cartoons. I've thought so ever since. What made them great, I think, was that Williams was so much a re­flection of what the thinkers call the American culture. The American isn't much like the happy, smiling, busy guy we see in the advertisement. His humor, when he has it, isn't the kind of jokebook juke we see on television. The Yank is really a very sad, rather wry-humored guy. His wit, at its best, is close to tragedy. Above all, he's nostalgic. Everything, he fondly be­lieves, was better when he was young­er, poorer, when he lived in the small town with the tree-shaded streets, when life was simpler, when the com­plications were fewer. He is oppressed, periodically, with a burning desire to take everything on his desk, throw it out the window and go live forever on a raft in the Mississippi, floating through the lazy, endless American summer with Huck and Jim and the King and the Duke. But the poor guy is trapped in his get-ahead, H. T. Webster-Mamaroneck kind of world, and he can't do anything about it. In my mind, inci­dentally, a relationship exists between those two cartoonists, Webster and Williams. Webster showed the Ameri­can the kind of life he has, and by laughing at it, made it bearable. Wil­liams showed him the kind of life he had, or likes to think he had or wants —a life in the saddle with Wes and Curley and the big colored man and the Chinese cook, and talking about everything under the sun. He also showed the American working in the machine tool plant with manly, hon­est guys who make things with their hands, and conspiring openly for the downfall of the Bull of the Woods. I think the Bull got punched in the nose a couple of times by his unpol­ished underlings, but it's interesting to note that he never got stabbed in the back. Jim Williams never did un­derstand big city ways. This, I think, is what Jim Williams did for his country. With wry, gentle and sad humor, he recalled for each of us the warm and happy past. It was said of someone (and with ad­vancing years I forget who) that he was America's conscience. Jim Wil­liams filled a parallel role. He was America's memory. In The Muggles Bob Casper had such a striking simple yet stylish art style it's a shame that nobody told the guy the only missing ingredient was a good gag writer. Three of the four gags above were old when they were carved in the vomitorium walls of Rome, and I had to dig through a couple month's worth to pick these as the best of the bunch. Every dog has his day, though, and the last strip is pretty good, but then I'm a sucker for self-referential gags. Too bad the paper from which these were clipped ran The Muggles on a classified page -- the dog was actually looking down on Apartments To Let. The Muggles was syndicated by General Features from February 2 1959 to January 28 1961. The only other credit I can find for Bob Casper is in the late 90s with one of those crummy internet-based syndicates that specialize in 'syndicating' amateur work to a non-existent client base. What a shame. Anyone know what Casper was up to in all those intervening years? The reason I ask is that among the pretty fair number of editorial cartoon books I have is a series of three books put out by the Star of election cartoons, one in '48, one in '52, and one in '68. Gib Crockett and Jim Berryman split the '52, and Gib holds down the '68, though Clifford Berryman still shows up in the '48, a year before he passed on. Jim was at the Star from 1948-53. Why his cartoons didn't make the cut for these books I dunno -- we'll have to wait for Jim to weigh in on the subject. Jim Ivey being a young man on the Star's staff in the late 40s/early 50s echoes the early 30s in Chicago, when you had McCutcheon and Orr at the Tribune squaring off against Shoemaker and Block at the Daily News. I'm going to engage in idle speculation: perhaps Jim was used to comment on local Washington matters, and thus wouldn't have shown up in a book dedicated to cartoons on national politics. Hmmm...wonder how often he got to meet Cliff Berryman, then.